You have a digital video recorder (DVR) or network video recorder (NVR) recording and storing all your surveillance footage while you want to access their video recorder remotely over the internet from a mobile phone, web browsers or a computer at another location outside your home. So how do you connect NVR/DVR to the internet and set up or configure them for remote viewing or access outside your home network? DVRs/NVRs are normally equipped with standard processors and embedded operating systems; however, many old analog DVRs don’t have the ability to connect it to the internet for remote viewing. DVRs/NVRs that have a built-in network capability can be accessed over the internet remotely or outside your home network on a computer, desktop video surveillance software, phone apps or web browsers. If a CCTV DVR or NVR don’t have a built-in WiFi support, then you have to run internet cable (CAT 5 or CAT 6 Ethernet cable) to connect your DVR or NVR to the internet via the router. Of course, by using another WiFi router/access point as a wireless bridge, you could connect a CCTV DVR to your router wirelessly. To connect a DVR/NVR to the internet or configure a DVR/NVR for remote viewing, first and foremost, connect your DVR/NVR to your network router either via Ethernet cable or wirelessly. Network–enabled DVRs could be configured for remote viewing. Port forwarding is the key to remote viewing and remote access. By forwarding ports (HTTP port and Server port) on your DVRs and your router, you punch a hole in your home network firewall and allow access to the video stream remotely from outside of your home network (also known as LAN). Port forwarding works when you want to view live video feeds or footage on NVRs over the internet on web browsers like IE, FireFox or Google Chrome web browser. 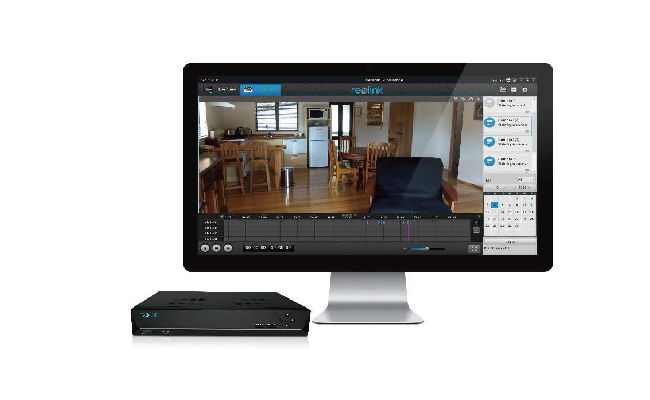 Alternatively, you could use NVR viewing software, video surveillance software or ONVIF supported third-party video management software to view your NVRs remotely, such as Blue Iris, Milestones, or ZoomMinder. To view your NVR on a viewing software, video management software or mobile apps remotely, one of the simplest approaches is to connect the NVR to the internet and view footage remotely via account login or via UID, a unique a unique ID number registered and integrated at the developer level, such as Reolink NVRs. Depending on different models, users can use NVR’s IP address to log into the NVR viewing software. 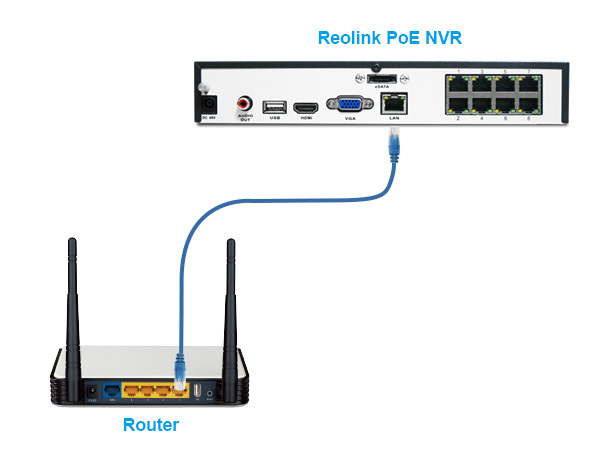 View Reolink NVRs on Reolink Client or mobile phone app, normally, is effortlessly easy; all you need to do is to log in your NVR account (name and password) and access NVRs for remote viewing and video playback. Chances are you don’t have a wireless security camera system with an NVR with built-in WiFi capability. While you have a PoE wired security camera system with a PoE NVR, more often than not, you are placing a wireless security camera in a remote location where you couldn’t or hard to run a network cable to your PoE NVR. In such case, users could use your WiFi router act as a bridge to connect your WiFi IP cameras to your PoE NVR wirelessly without running network cables at all. While doing so, make sure both of your wireless security cameras are connected to your router wirelessly and your NVR is connected to your router via Ethernet cable. This entry was posted in How-to Guide and tagged connect nvrs to internet, set up nvr remote viewing. I hand no trouble with my old computer and nvr 10s –then I bought a new computer and lost everything. How can I get my nvr onto my new computer? Hi, Bob, please confirm that you have put your new computer into the same LAN that you are running. You can try to download client offered by the NVR’s manufacturer if it is available or other trusted third-party viewers to watch live view on your new computer. Hope this would help. Is the Riolink phone app able to see poe cameras on the NVR and Airgus 2 cameras? Hi, Wade, the answer is definitely yes. For Argus 2, you only need to enter your unique ID number (UID) and password to add the camera to the app. 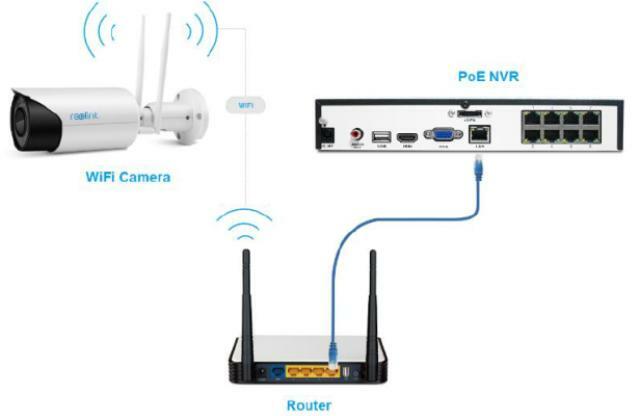 For PoE cameras on the NVR, please connect your NVR to network router via Ethernet cables or wirelessly. Then by entering your NVR account and password on the app, you can see PoE cameras on the NVR. Hope this would help. Hi, there, we are not sure about which brand your NVR is. But we suggest that you use customized Client or APP from the NVR seller to access your NVR, which can free you from this problem. Hope this helps. You should try internet explorer, the plugin only works in that browser. Hi, Chardy, please check if your currently using WiFi works well by visiting other websites. Also remember to update the firmware of the software and your security system as well to see if it works. Is it possible to connect POE cameras to the POE NVR wirelessly through a POE switch? Looking to put the cameras in the barn and NVR in the house 350 ft away. Hi Alex, yes, you can do so and remember to connect the PoE switch to the NVR as well. You may check here /choose-select-buy-best-poe-switch-for-ip-cameras/ to learn how to choose the best PoE switch for your PoE cameras. Hope this helps. Will the NVR work with the RLC-511W if they are linked to separate wifi networks. We want to set up a RLC-511W on an office building and use the office wifi for the camera, but then set up the NVR at a different location on a separate network. If we do this will the NVR be able to record, provided the wifi connection is capable? Hi Jake, RLC-511W will only record to the NVR when they are under the same WiFi/network connection. You may check here https://support.reolink.com/hc/en-us/articles/360007011053-Add-Reolink-IP-Cameras-to-Reolink-PoE-NVR to learn how to add RLC-511W and other Reolink WiFi security cameras to the NVR. Hope this helps. Hi, there, please check the firewall settings of your router to see if it has blocked eternal access to your security cameras. Hope this helps. Hello, Allan, in your case, your DVR system can’t connect to the WiFi remotely and a cat 5 Ethernet cable is required. Hope this helps.